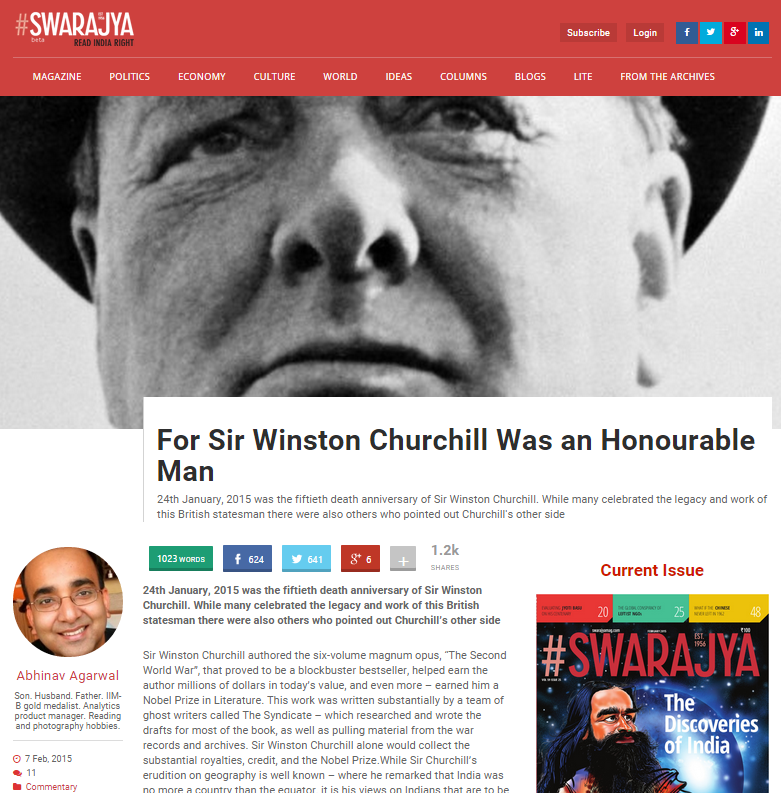 I penned a short article on Sir Winston Churchill that appeared in Swarajya Magazine on Feb 7, 2015. It, to my surprise, went viral and attracted more than one thousand "shares" on social media. Sir Winston Churchill authored the six-volume magnum opus, “The Second World War”, that proved to be a blockbuster bestseller, helped earn the author millions of dollars in today’s value, and even more – earned him a Nobel Prize in Literature. This work was written substantially by a team of ghost writers called The Syndicate – which researched and wrote the drafts for most of the book, as well as pulling material from the war records and archives. Sir Winston Churchill alone would collect the substantial royalties, credit, and the Nobel Prize.While Sir Churchill’s erudition on geography is well known – where he remarked that India was no more a country than the equator, it is his views on Indians that are to be cherished even more. He told his private secretary that ‘the Hindus were a foul race “protected by their mere pullation from the doom that is their due”‘ “He wished that Air Chief Marshall Arthur Harris, the head of British bomber command, could “send some of his surplus bombers to destroy them.”” No opprobrium would come Sir Churchill’s way. Apart from supplying her soldiers “for some of the toughest combat in countries and the Mediterranean Sea, India was designated to provide the bulk of supplies for those theaters. Starting in May , Amery oversaw the effort to ship from India around 40,000 tons of grain per month, a tenth of its railway engines and carriages, and even railway tracks were uprooted from less important train lines. The colony’s entire commercial production of timber, woolen textiles and leather goods, and three-quarters of its steel and cement production, would be required for the war. . . Apart from the United Kingdom itself, India would become the largest contributor to the empire’s war – providing goods and services worth more than £2 billion.” Sir Churchill would record this fact somewhat differently in his semi-fictional, romanticized retelling of the War – “They [India] were carried through the struggle on the shoulders of our small Island. … No great portion of the world population was so effectively protected from the horrors and perils of the World War as were the peoples of Hindustan.” The truth is the refuge of the weak. No such bindings for the great. Leopold Amery, Secretary of State for India during the War, once told Sir Churchill that he saw little difference “between his outlook and Hitler’s” and that he recorded in his diary that he was “by no means sure whether on this subject of India he [Churchill] is really quite sane.” Amery also believed that Sir Churchill saw the “Bengali babus through the same lens as anti-Semites might perceive Jews.” But there can be no comparison of Sir Churchill with Adolf Hitler. And, in closing, let us not even get into Sir Winston’s role in preventing foodgrains and supplies from reaching a starving population of Bengal, where an estimated 5.7 million people died on account of the famine – a number only a shade less than what were murdered by Hitler’s butchers in concentration camps. It would be only in 1949 that the Geneva Convention guidelines would be extended to “include a prohibition against starving civilians in occupied territories.” Could Sir Winston Churchill have been tried as a war criminal along with other Nazi criminals at the Nuremberg Trials? Certainly not. Because Sir Winston Churchill was an honourable man.